Liberia’s Ambassador to France Dr. C. William Allen has presented his credentials to the director general of UNESCO accrediting him as Liberia’s ambassador and permanent delegate to that body. 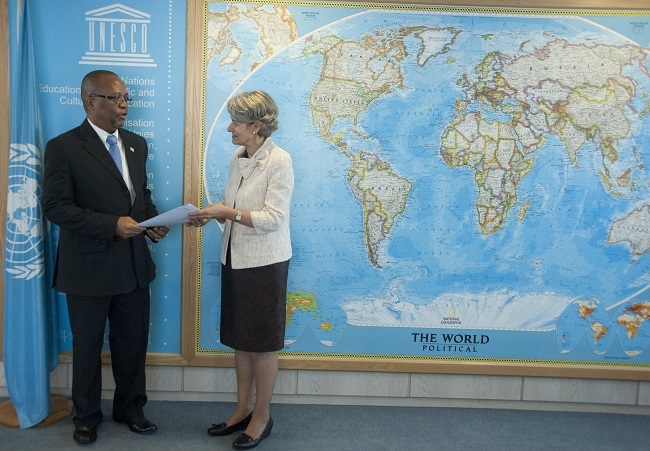 Director General Irina Bokova welcomed Dr. Allen to UNESCO and expressed her concern about the dire Ebola situation Liberia is confronting. Mrs Bokova committed herself to the national development of Liberia through the five regional offices in Africa and the flagships programs which UNESCO’s African Department are developing. She also said that the United Nations is taking the Ebola virus seriously and that recently in Equatorial Guinea during the Prize Ceremony for Life Sciences, a special commemoration was organized for the three most affected countries– Liberia, Sierra Leone and Guinea. For his part, Ambassador Allen conveyed personal greetings from Liberian President Ellen Johnson Sirleaf and reconfirmed that as a founding member, Liberia remains committed to the fundamental principles on which the organization was founded in the aftermath of the Second World War which, among other things, is to contribute to peace and security by promoting collaboration among nations through eduction science and culture. Ambassador Allen highlighted the commitment of President Sirleaf toward education in Liberia and focused on specific areas that Liberia needs to benefit from UNESCO, such as science and technology, culture and teacher’s education. The ambassador reminded the director general of her pending visit to Liberia in December and urged her to keep Liberia on UNESCO’s radar by maintaining that scheduled visit. In closing, Ambassador Allen said that even though Ebola is a serious distraction at this time, with the collective help of the global community, Liberia remains optimistic that the spread of the virus would, in time, be stopped. He reiterated the need for Liberia and UNESCO to remain engaged in spite of Ebola so that Liberia would continue to benefit from the many opportunities and program offered by UNESCO. Ambassador Allen was accompanied to UNESCO Headquarters by Ms. Raddie Perry, the Charge d’Affairs, ad interim, and Ms. Jenny Marday, UNESCO Coordinator at the Liberian Mission in Paris.